Is it not the responsibility of the MCCSC to provide the public with a complete and clear list of agenda topics for each monthly school board meeting? If anyone had been tracking the issue of substitute teacher compensation post-president Jim Muehling’s “pre-emptive comment” delivered in December, where he said “Peggy Chambers would be reviewing not only substitute teacher compensation but compensation of all nonunion support staff” in the near future, they would have, like me, been caught unawares by the announcement at a board meeting last month that Ms. Chambers was recommending a $3 dollar per day “raise” for MCCSC substitutes. To the casual observer, one might think, “Gee, that must be topics related to dress code, maybe computer use, ‘code of ethics’ and policy statements, or even rules regarding safety on the job or the annual employee picnic,” but not a “meat and potatoes” discussion of employee pay scale review! A clever “smoke and mirrors” dodge by the administration and/or our school board, wouldn’t you say? 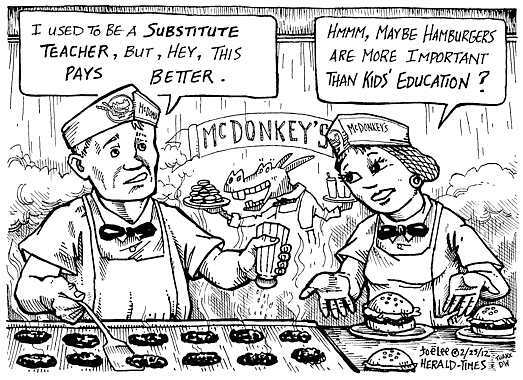 The hot topic of substitute teacher compensation has been with us for almost a year now. For the past decade, the pay rate for MCCSC sub teachers has been flat; they have never been privy to the annual incremental pay increases awarded to other dedicated support staff members. Plus, with the new (and questionably popular) extended day, these essential and educated individuals took a 15 percent pay cut, e.g., no pay adjustment for the extra hour per day they log. This entry was posted on February 27, 2012 at 9:59 PM and is filed under MCCSC Sub Teachers Unite!. You can subscribe via RSS 2.0 feed to this post's comments.